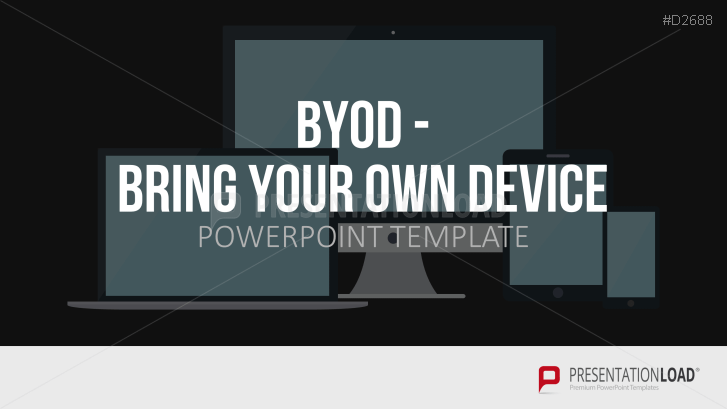 Template set for PowerPoint to illustrate and outline the BYOD concept. Present the perspective of the company and the employee when launching the Bring Your Own Device (BYOD) strategy. Implement requirements and rights, illustrate security measures and explain the digression on mobile device management all in one set. BYOD stands for the usage of private mobile devices of employees in the corporate network. It offers benefits such as increasing efficiency in operating individual devices, simplifying usage to a single device instead of many and providing additional mobility, which results in a boost of employee satisfaction. Problems are caused by several unbalanced equipment, costs of IT security and sometimes equipment purchases and support. In addition, data protection issues have to be solved (and the consequent separation of private and business data must be accomplished.) In any case, a controlled application should take place in order to prevent any outflow of sensitive data from the company. This implementation is the responsibility of IT decision-makers with the support of corporate management. This template allows you to define BYOD and the main legal requirements, such as labor law and contracts, as well as safety aspects, such as presenting technical and organizational measures. You can then round off the set with explanations of "Mobile Device Management." the definition and overview of "Mobile Device Management"
Thanks a lot that the product is free after buying both of the flat design bundles. This one is great too. nice work! there could have been some more templates, but the price is okay.